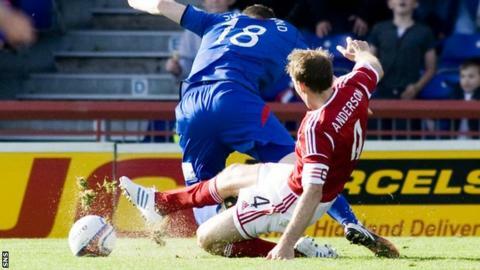 Aberdeen captain Russell Anderson has had his red card rescinded after a successful appeal against his dismissal at Inverness on Saturday. The 33-year-old was sent off for the first time in his career when referee George Salmond awarded the hosts a penalty, which was converted. Richie Foran's spot-kick was cancelled out by Cammy Smith's late equaliser. Inverness were already a man down, with Owain Tudur Jones sent off before Anderson was shown a red card. Salmond ruled that the Scotland defender had pulled down Shane Sutherland at the Caledonian Stadium. But the Dons challenged the referee's decision and television evidence of the incident was reviewed. Immediately after the match, Aberdeen manager Craig Brown refused to speak about the officials' performance, or comment on two disputed penalty-box incidents. And, after Anderson's successful appeal, Brown told his club's website: "I am very pleased. "I respect the referee greatly for making that decision. It would have been easy for him to stick to his guns but he has looked at it, apparently, and his letter to the committee was influential. "So George Salmond deserves the utmost credit. At the time it did cost us a goal and a player and we had to play the last half hour without Russell. "But it is over and done with now, we accept the decision and we thank the committee and referee for their honesty. "I am delighted to have Russell available for what will be a very important game against Motherwell on Sunday."